This quick and easy homemade marinara sauce recipe will make sure you always have some delicious and flavorful sauce on hand. Plus, it can be made with canned or fresh tomatoes and freezes well. I have a weakness for wholesale clubs. If you’ve ever walked down the aisles at Costco, surely you’ve seen the giant boxes of delectable pasta and all the screaming-to-be-cooked canned vegetables (of which there is now a wide variety of organic options). They have the building blocks for all the good pasta dishes, and you can buy them in bulk. I’m getting goosebumps just thinking about it. And now you see my problem. Or, as I like to think of it, my potential for an endless stream of tasty carb-loaded dinners. So with a kitchen fully loaded to make tons of pasta, it’s probably no surprise that I do exactly that. Over the past few months I’ve come up with a quick homemade marinara sauce that I use for just about everything – dips, sauce, a bed for stuffed shells, you name it – and since I have even more plans for it in the future, it only seemed fitting to (finally) post a recipe of the sauce on its own. Yes, you totally can! Just use the equivalent amount of canned tomatoes listed in the recipe. Just be sure to prepare the tomatoes for the consistency you want (smooth, chunky, etc). This sauce looks chunky. Can it be made smooth? I (clearly) tend to like a chunkier marinara sauce, so when I make it, I used a can of diced tomatoes. That’s what gives the sauce the look you see in the pictures here. If you want a smoother sauce, you can either pulse the diced tomatoes in a food processor OR you can use a can of low-sodium, unflavored tomato sauce instead. And if you’d like an ultra-smooth sauce (even without any visible minced garlic) you can make the sauce as directed, let it cool slightly, then pulse it in a food processor until it’s all a solid, creamy red. How long is homemade marinara sauce good for? Once made, this sauce can be stored in the refrigerator in a sealed container for up to four to five days. Can you freeze marinara sauce? Yes! This sauce is great for freezing. Once made, allow the sauce to cool to room temperature, then transfer to a sealable container (freezer bags are okay, too). This sauce can be frozen for up to four months. What can you make with marinara sauce? Marinara is a simple sauce and not nearly complex as it’s cousin tomato sauce (also referred to as pasta sauce, spaghetti sauce, etc). 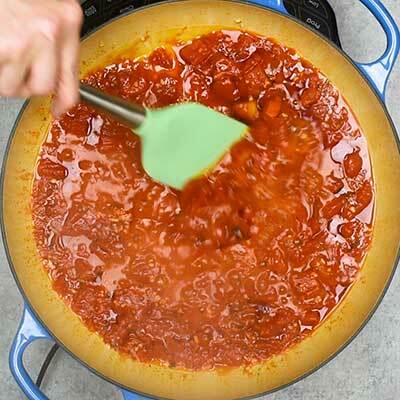 However, in a pinch, marinara can be used in a lot of the same recipes as tomato sauce. In fact, if you’re making a really complex dish, a simple marinara sauce might even be a better choice since there will be less competition for all of the other flavors. 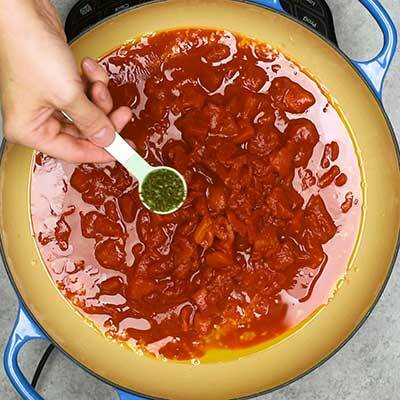 As mentioned above, you can change the consistency of the sauce depending on what type of tomatoes you use. Want an extra thick and chunky sauce like the one pictured? Use diced tomatoes. Want an ultra smooth sauce? Use tomato sauce (or pulse the tomatoes in a food processor). Want a sauce so smooth you can’t even see the garlic? Then pulse the sauce after you’ve made it. 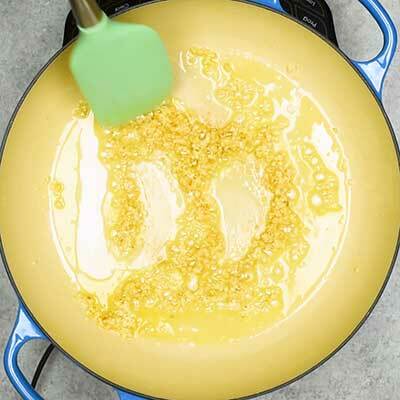 Step 1 – In a large, deep skillet, warm up extra virgin olive oil. Toss in the garlic and cook until the garlic is golden and fragrant. Be sure to stir frequently so the olive oil and garlic don’t burn. Step 2 – Pour in the tomatoes (either diced or sauce) and season with thyme, salt, and red pepper flakes. Stir thoroughly, then cover. Step 3 – Let the sauce cook, stirring occasionally. 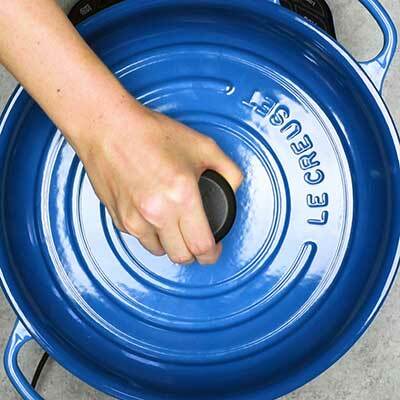 Step 4 – Remove lid and give the sauce a final stir. If you feel the sauce still has too much water, keep the sauce simmering for another five to ten minutes, stirring occasionally, until the excess water has cooked off. This recipe was originally published on May 6th, 2016. It was updated with new text and photos on July 24th, 2018. In a large skillet, warm the extra virgin olive oil over medium heat. Add garlic to skillet and cook until golden brown and fragrant, about 2-3 minutes. Pour in tomatoes (diced or sauce), thyme, salt, and red pepper flakes. Stir sauce until thoroughly incorporated, especially along the sides where the olive oil may sit. Bring sauce to a simmer, then cover skillet. Cook for 15 minutes, stirring occasionally. Remove cover and stir sauce. If sauce appears too watery, allow to simmer, uncovered, stirring occasionally, for an additional 5 to 10 minutes or until desired consistency is reached. I am so happy that you came up with a good marinara recipe. I love tomato paste and everything that goes well with it.However, my big bump in the road is that I cannot use canned tomatoes or I get a skin reaction ( I am guessing it has to do with the preservatives or something in the can), so I have no other option but to make my own. I have to say that once you have home made marinara sauce chances are you will never be able to go back to any store bought ones. The flavors of the tomatoes when they are fresh is just floral.They have this sweet aroma that you just can’t find in anything that’s been sitting on a shelf. I love this recipe, it is simple, delicious and healthy. How much better can it get? Your marinara looks fantastic and is so easy to make! Nothing better than a bowl of pasta and homemade marinara, thank you! There is nothing better than homemade sauce! Never ever by store-bought! Such a waste! Nothing beats the fresh taste of a homemade marinara sauce. It looks delicious, too. Making your own sauces is a great way to save money. Thank you for such a great recipe! Those are some beautiful photos. I want to reach in and take a spoonful of that sauce. I love making my own sauce. Your version looks great! Damn, this looks good!! You’re right, flavour is super important, and sometimes a little tricky to create in these kinds of sauces, especially if the chunky tomatoes area little watery. I never have made my own pasta sauce before for some reason and you definitely have inspired me to here. Clearly this marinara sauce is so hearty and flavoursome.. that I have to make it! Really lovely. I do both a smooth and chunky variety. I can’t decide which one I want until the last minute! Actually I prefer using good quality canned tomatoes over the best, ripest fresh tomatoes. That’s just me. I have made this recipe twice now!! I use an imersion blender so that it’s not so chunky! I love this recipe because it’s so versitile! Add in a pound or so of ground beef and cook for a few hours and it’s becomes a super delicious meat marinara!! Half of my family recently decided to try being vegan, and the other half is agreeing to give pescetarian a try. Tonight we agreed on pasta and marinara sauce only to discover we were out of marinara! Found this recipe and decided to give it a try. Family loved it! Good flavor, easy, and quick. I will definitely make it again.